Flying Termites or Termite Swarmers are the early Signs of Termites along with visible Termite Damage. Our Termite Control technician will perform detailed termite inspections to identify the source of the Termite Damage and create custom Termite Treatments to eliminate the Termites. Call Today. 1-844-305-8999. Termites were once classified in a separate order from cockroaches, but recent phylogenetic studies indicate that they evolved from close ancestors of cockroaches. Although these insects are often called white ants, they are not ants. If you see these in or around your home Call Dependable Exterminating as soon as possible. Our Termite Exterminator will utilize the latest and most effective Termite Treatments available to eliminate the termites from your home. 1-844-305-8999. Life Cycle: During late winter or early spring, swarms of the reproductive caste may be noticed in infested buildings. 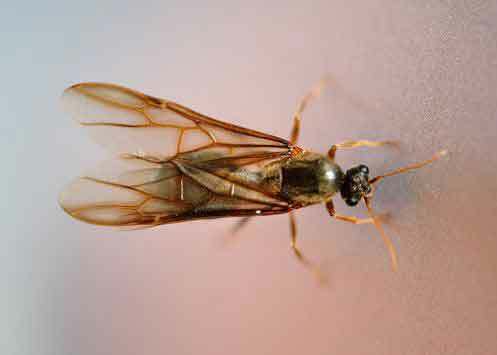 These dark colored, winged termites are the stage most commonly seen, since the other castes do not expose themselves to light. 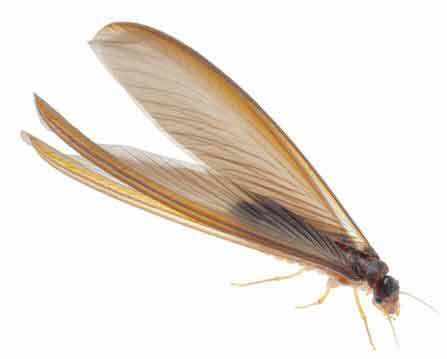 Winged termites are attracted to light, and when they emerge within buildings, they swarm about doors and windows. Like ants and some bees and wasps from the separate order Hymenoptera, termites divide labor among castes consisting of sterile male and female "workers" and "soldiers". All colonies have fertile males called "kings" and one or more fertile females called "queens". Termites mostly feed on dead plant material and cellulose, generally in the form of wood, leaf litter, soil, or animal dung. Termites are major detritivores, particularly in the subtropical and tropical regions, and their recycling of wood and plant matter is of considerable ecological importance. See Below for the Termite Family Roles. 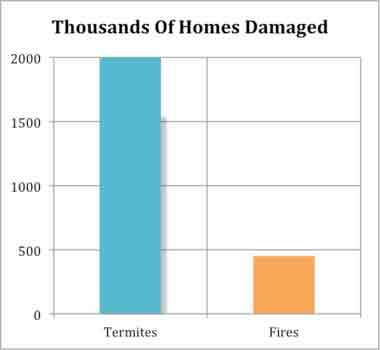 Termites cause between 2-3 billion in damages annually, that's more damage than fires, storms and earthquakes combined. Termites never stop eating, they work 24 hours a day 7 days a week. Your home is the largest and most valuable asset you'll have. If you have signs of termites, Protect it now! Our comprehensive Termite Treatments program is designed to give you peace of mind knowing that your home is protected from the damaging effects of termites. The extent of damage to structural timbers and woodwork can be determined by a careful inspection of the building. Although you may choose to make the inspection yourself, we recommend you give us a call to inspect the building. At Dependable Exterminating we specialize in Termite Control and have the experience in detecting termite infestations that many people would otherwise overlook. 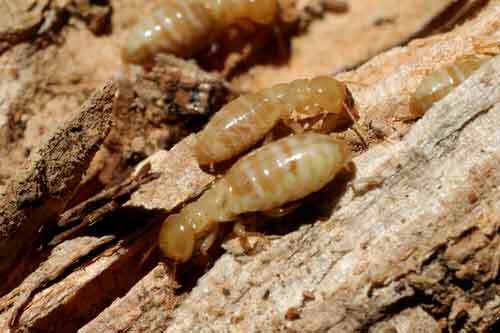 A termite’s mouth is capable of tearing pieces of woody material. This ability is what causes concern in human dwellings: while termite workers only measure approximately 1 cm to a few millimeters in length, their feeding habits can cause costly damage to property. House foundations, furniture, shelves and even books are all possible feeding sites for termites. 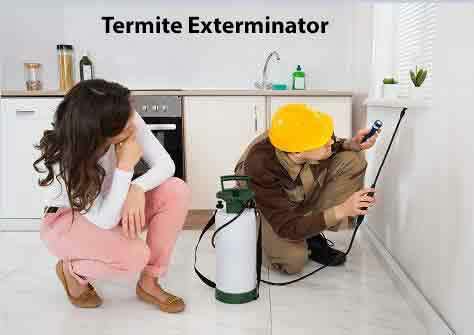 If you notice you have Termite Damage or notice flying termites give our Termite Exterminator a call today. 1-844-305-8999. Termites are among the most successful groups of insects on Earth, colonizing most landmasses except for Antarctica. Their colonies range in size from a few hundred individuals to enormous societies with several million individuals. 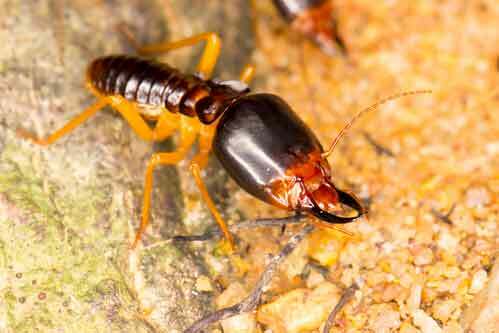 Termite queens have the longest lifespan of any insect in the world, with some queens living up to 50 years. 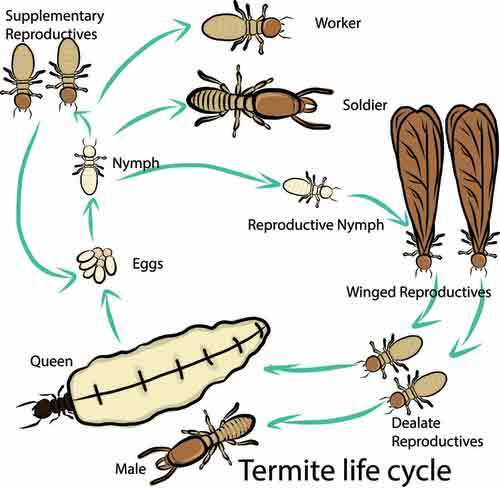 Unlike ants, which undergo a complete metamorphosis, each individual termite goes through an incomplete metamorphosis that proceeds through egg, nymph, and adult stages. Colonies are described as super organisms because the termites form part of a self-regulating entity: the colony itself. Eastern subterranean termites are present in New York City NY, Westchester County NY, Rockland County NY and Orange County NY and often damage structural timbers in buildings and in homes. When this damage becomes evident, it is usually the result of a few years of infestation. Termites are often called the “silent destroyer” because they may be secretly hiding and thriving in your home or yard without any immediate signs of Termite Damage. 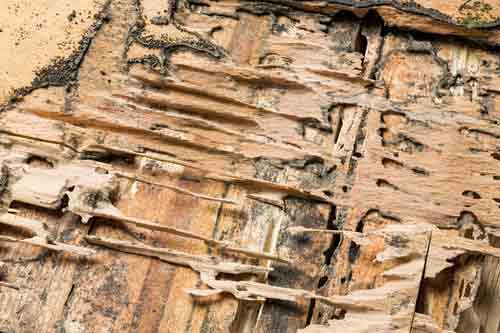 All termites consume cellulose-based plant materials. 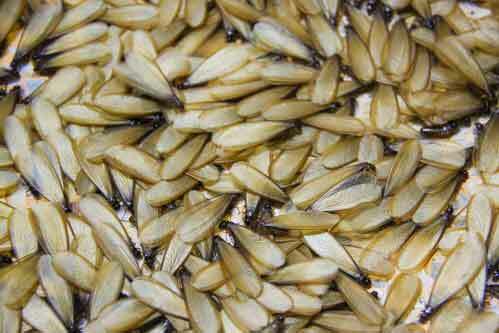 Unfortunately, all homes, regardless of their construction type, can provide cellulose food for termite infestation. Termite protection begins with Our Termite Exterminator, we will go over our Termite Treatments methods and termite control options.